Please precise what is your version of VDJ 8 Pro, your operating system, where you load the effects and how you try to use them. and when I press the pad, the pad blinks and the effect is processed and hearable in both the preview and the master output. I have added the echodoppler from the VDJ add-ons and it is very hearable when I use it assigned to pad 3. 4) if you press on one of the 8 pads (on screen) you hear the beat it represents while keeping on playing the song: it is the slicer effect. DJControl Instinct pads do not control the 8 pads inside the slicer, they just control the on/off controler of the slicer. and when I press that respective pad on my p8, the pad even blinks and the effect is processed and it shines up on the Pc screen too, but still, i don't hear the effect on the track and it's neither hearable in both the preview and the master output both. similarly, all effects also work normally if i i use just the laptop without the p8 controller i can hear the effects that i have activated. i bought this portable controller to carry in my laptop bag. but now i can't seem to use it on VDJ which i use very frequently. If you cannot hear some effects in VirtualDJ 8, it probably means these effects are not adjusted as you wish. 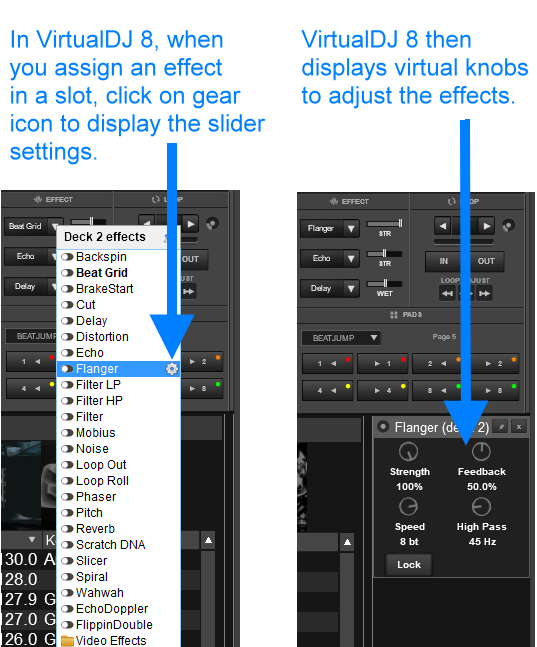 Please check in VirtualDJ 8 effect settings, the position of the gradual knobs of VirtualDJ 8 effect menu when DJControl Instinct P8 is connected to your PC.